HAYS, Kan. – Fort Hays State University junior Jasmine Turley, Beloit, was recently selected as a 2018 Newman Civic Fellow through Campus Compact, a Boston non-profit organization devoted to advancing the public purposes of higher education. Turley, who is majoring in biology, credits her peers, professors and the campus community for her success. 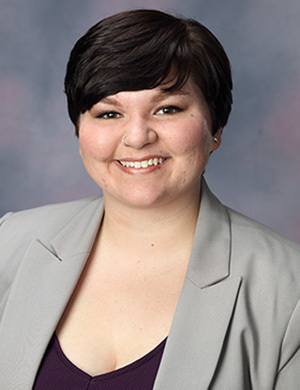 During her three years at FHSU, Turley has been extensively involved and has served in multiple leadership positions, including as a new student and family orientation leader, Student Government Association senator, Allocation Committee member, vice-chair of the Kansas Board of Regents Diversity and Inclusion Task Force and co-chair for the SGA Legislative and Political Action Committee. “You become a part of something bigger. I am forever grateful to my campus community for giving me the opportunity to be a part of something bigger,” she said. The Newman Civic Fellowship is a one-year experience emphasizing personal, professional and civic growth. The fellowship provides a variety of learning and networking opportunities, including a national conference of Newman Civic fellows in partnership with the Edward M. Kennedy Institute for the United States Senate.